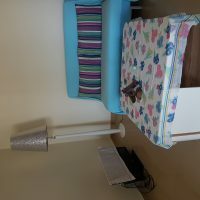 1 bedroom, Home in Mashareq for rent. Furnished, modern style. Look as new. TV. Rent out to european as treat my home nice,carefully. 2 balcony, very quiet and privat area. Nobody can look into balconies. Long term rental. Good clean swimmingpool. Location: second line from the sea. Near Palmyra resort and bus stop is in Tiran aquapark, 10 minute walking from home. Please call me, or send message if you are interested. My home can be ready very soon, for the right person.